Choosing vinyl siding for your home is lo little decision. After all, you do have to look at it for the next 20-40 years. Luckily, there a few tips that you can follow to ensure that you make the perfect choice. In today’s blog Nice Shingles Roofing & Exteriors, your local roofing, gutter, and siding contractors in the Pocono’s and Stroudsburg area, will be discussing a few of the considerations that you should make when determining what siding you would like installed on your home. 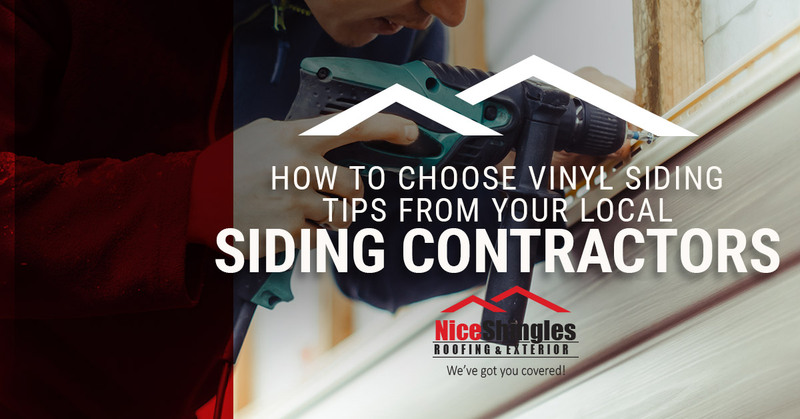 And if today’s blog post doesn’t answer all your questions, don’t fret — getting extra siding advice is as easy as contacting us at Nice Shingles Roofing & Exteriors and asking to speak with one of our experienced siding contractors. Arguably one of the most important considerations that you should make when choosing your siding is your budget. There are many different variations of siding, existing in different tiers of quality, meaning that not all vinyl siding is created the same — so the prices vary. As a siding contractor, we understand the difficulties associated with choosing and buying, vinyl siding — with the most difficult part being when you see the price tag. Sure, vinyl siding is cheaper than some other alternatives, but siding an entire home can get pricey. That being said, we want you to think of it as an investment — being that they can last up to 40 years in proper conditions. To discuss various siding materials and pricing, contact us to request a free quote. While it might seem a little silly for a siding contractor to suggest that you carefully pick a color of siding, we would hate for you to have a change in the heart once your siding has been installed — being that it can be a pretty costly change in heart. When considering the color for your new vinyl siding installation, it is important to consider a number of factors. What other colors for homes are in your neighborhood? Does your homeowners’ association have any regulations or restrictions? How will the color weather over the next 20-40 years? Once you have chosen a color and found it to satisfy all of the questions that you had, it is time to schedule a free quote and consultation. What Siding Contractors Should You Use? There are quite a few siding companies here in the Pocono’s and Stroudsburg areas, and that can make it harder for you, as a homeowner, to choose what company to hire. But let us make choosing a siding company easy for you — choose us. Hey, thanks for your kind words, Stephen. As a siding contractor that performs siding repair and full vinyl siding replacements, we work hard to ensure that every customer feels just like Stephen! Contact us today for more information or to request a quote!